Die Compact Disc ist nach wie vor der meistbenutzte Ton- und Datenträger weltweit. Das herausragende Kosten / Speicherplatz-Verhältnis hat die CD zum dominierenden Medium in allen Märkten werden lassen. Extensively experienced in replicating this popular disc format, we use the latest technology to provide you with the highest quality products. The numerous advantages of this format include interactivity, integrated graphics, videos, music, voice and animation. 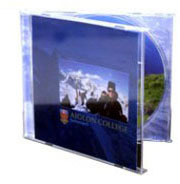 This makes CD-ROM the format of choice for a wide variety of applications such as games, software or catalogues. Sparked a revolution in the music and recording industry and have now become a globally-accepted media. ADIVAN has been producing CDs since 1994. Our vast experience and ADIVAN technological leadership today allows us to manufacture more than 100,000 CD products per day! We not only replicate CDs, but also provide related services such as premastering, mastering, copy protection, packaging and fulfillment. What CD products does ADIVAN offer? 12 cm CD-Audio Disc: Playtime up to 74 min. 08 cm CD-Audio Disc: Playtime up to 20 min. See the Artwork & Packaging section for more presentational ideas. Specifications for CD label can be found at CD Downloads.